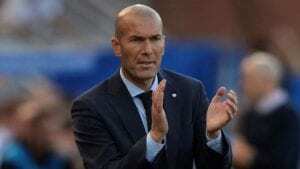 Real Madrid manager, Zinedine Zidane, has been left fighting for his job in the second half of the LaLiga season, after his team were shocked 1-0 at home by Villarreal on Saturday. If their rivals and table toppers Barcelona beat Real Sociedad on Sunday, they could open a 19-point gap, although Zidane’s men have one outstanding game. There is also no guarantee that the champions will finish in the top four either as things stand, given Villarreal are now just one point behind them in fifth. Zidane’s side have now failed to beat Valencia, Levante, Betis, Tottenham, Fuenlabrada, Barcelona and Numancia at home this campaign. Despite winning back-to-back Champions League trophies and a first league title since 2012, Zidane could still be sacked by the notoriously impatient president, Florentino Perez. Already, names like Carlo Ancelotti and Jose Mourinho, have been linked with a return to the Santiago Bernabeu. Zidane will be looking to put Real’s campaign back on track this week, as they play the Copa del Rey quarter-final against Leganes. It will be his only hope of silverware, along with the Champions League, where they face Paris Saint-Germain in the knockout rounds.